Following his departure as Daily Mirror editor over the Iraq abuse photo row, BBC News Online looks back at the career highs and lows of Piers Morgan. Morgan was arguably the best-known national newspaper editor since his good friend Kelvin MacKenzie edited the Sun in the 1980s. He became editor of the News of the World aged just 28 - the youngest national newspaper editor for more than 50 years. Two years later, he was headhunted to edit the Daily Mirror. Born in 1965 in an East Sussex village, Piers Stefan Pughe-Morgan was youngest of four children of a meat distribution executive. He was named after racing driver Piers Courage. He attended boarding school but moved on to a comprehensive and sixth-form college. After school he studied journalism at Harlow College and worked for local south London newspapers before being spotted by Kelvin MacKenzie. He was given his own showbiz column, Bizarre, where Mr McKenzie encouraged him to establish his trademark - pictures of Mr Morgan with the rich and famous. He became News of the World editor in January 1994, and moved to the Mirror in November the following year. Controversy was never far away. Shortly after taking the Mirror job, he caused outrage with his headline "Achtung Surrender! ", the day before England's Euro 96 clash with Germany. But the ardent Arsenal fan has always been prepared to defend his decisions. He readily faced MPs' questions about his recent publication of the photos allegedly showing abuse in Iraq. He stood by the decision to publish despite doubts over the pictures' authenticity, and refused to reveal his sources. 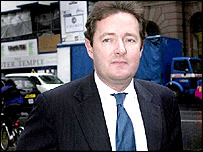 In the past, Morgan has robustly defended the role of tabloid newspapers against criticisms over invasions of privacy. He was furious when the Mirror lost a long-running case against supermodel Naomi Campbell, who claimed coverage of her drug addiction treatment in 2001 invaded her privacy. The Appeal Court had previously ordered she pay the paper's £350,000 costs, but a Law Lords judgement leaves the Mirror facing more than £1m legal costs. In fact, Morgan has seemed ready to take on anyone, even prime minister's wife Cherie Blair. He claimed in 2002 that she had tried to get him sacked, which Downing Street denied. Mr Morgan said: "She hasn't got me fired and it doesn't do her husband any favours for her to go around demanding the heads of editors." His career has been marked by a series of run-ins with the royals. Princess Diana's former butler Paul Burrell sold his story to the Mirror for £300,000 in November 2002. The paper said it fought off bids from over 400 media organisations to acquire "exclusive world rights" to the story. But one of the biggest royal rows was the Mirror's publication of letters between Diana, Princess of Wales and James Hewitt. The editor said the Mirror had passed the letters to Kensington Palace, having obtained them from a close friend of Mr Hewitt. "The Mirror tried to protect the name and memory of Diana from improper exploitation by James Hewitt and I am proud of having done so," he said. He caused one of his first royal rows in November 1998 with a story saying Prince Harry had hurt himself, despite pressure from royal press secretaries to drop it. The headline read: "Harry's had an accident but we're not allowed to tell you." In 2002, Morgan decided to drop the Mirror's famous red-top logo in favour of a less tabloid-style black and white masthead. 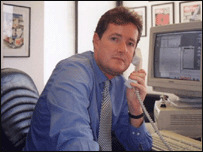 Piers Morgan hit the headlines himself in February 2000 when the Mirror became embroiled in a share dealing scandal - after several staff bought shares tipped in the paper's City Slickers column. He was rapped by the Press Complaints Commission for breaching the newspaper industry's code of practice. One of his most notorious gaffes followed his appointment as News of the World editor. He printed a front-page picture of Victoria Spencer, the former wife of Earl Spencer, in a detox clinic, against the editors' code of conduct. He received a dressing-down from the Press Complaints Commission and was publicly rebuked by Rupert Murdoch. It was the first of many scrapes that might have ended other editors' careers, but Piers Morgan went on to ride out regular controversy. "The glittering prizes came early for Piers Morgan"